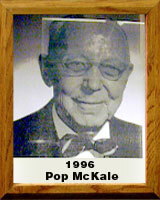 Dr. James F. McKale was born in Lansing, Michigan, in 1887 and graduated from high school in 1905. He earned his B.A. degree in chemistry and history at Albion College in 1910 where he left his mark as a quarterback, a star catcher and broad jumper. Declining an opportunity to play professional baseball, he chose instead to complete his education. As he did, he won All-Michigan Intercollegiate honors. “Mac” taught history and coached at Tucson High from 1911 to 1914 when, by popular acclaim, he joined the faculty at the University of Arizona. He was appointed Athletic Director in 1915 with a whopping raise to $1,800 a year. He coached every major sport and made Arizona’s athletic program the finest in the Southwest, leading teams in football for 17 years and in baseball for 35 years.